The Tigers are struggling again, for the second year in a row. They are currently under .500 for the third time this season, sitting seven games back of the first-place Chicago White Sox (because we all saw that coming). Optimistic fans are scraping the bottom of every barrel, looking for reasons to hope. Pessimistic fans are already declaring that the season is over. There is a lesson to be learned from the 2014 and 2015 Texas Rangers, however, if we have the patience to listen. Like last year's Tigers, the 2014 Rangers ran into a roving gang of injury demons who pantsed them, stole their milk money, and left them picking up their scattered textbooks in the hallway. The 2014 Rangers finished in last place, and they weren't really on anyone's radar for the 2015 season. Just prior to the start of that season, in fact, Fangraphs projected the Rangers to finish 67-95 in last place again. Instead, they w-- hey, who turned the reverb off on my mic? But it wasn't pretty getting there. 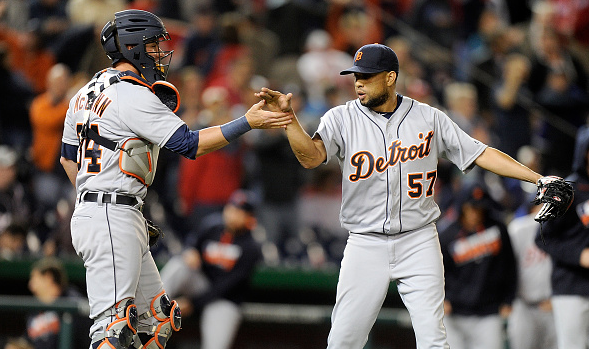 The Tigers have played 32 games this season, and are currently 15-17, seven games out of first place. After the same amount of time, the 2015 Rangers were 14-18, six games out of first place. A week later, they were 16-23, a full 9.5 games out of first place. Fast forward to July 22, a week or so away from the trade deadline. The Rangers were under .500 at 45-49, occupying third place, but still a nasty nine games behind the first-place Angels. Side note: the Angels were 54-40 (.574 win percentage), and they somehow managed to finish the season in third place, missing the postseason entirely. What the Rangers of 2015 needed was starting pitching. (Is any of this sounding familiar?) Their offense was decent enough, scoring an average of 4.3 runs per game, but their pitching was allowing an average of 4.6 runs per game. That's a losing formula. So they doubled down at the trade deadline and got Cole Hamels to give their starting rotation a shot in the arm. It worked. Yes, it took some time to see the payoff, but it worked. They climbed the ladder steadily, overtook first place on September 15, and finished the season with a division title. BUT THEY LOST IN THE FIRST ROUND OF THE PLAYOFFS, you remind me, using all-caps and italics for emphasis. Yes, they did. Carve this into your living room wall so you don't forget: the playoffs are a roll of the dice. Anything can happen in a short series. If the Tigers had to face the Indians in a best of five postseason series this season, they would have been swept. If they had to face the Pittsburgh Pirates, they would have advanced. Crazy, right? Forget postseason results. During the regular season, there is only one goal: just make it to the freaking playoffs. Get there any way you can, whether by winning the division or stealing one of the two Wild Card spots. The Tigers are definitely struggling, and it doesn't look good early on. But they are by no means out of the race yet, especially when you have to imagine that the Chicago White Sox are going to run out of "mojo" at some point. If the 2015 Rangers could go from nine games out of first place as late as the trade deadline and still win their division, it's way too early to look at the Tigers sitting seven games out of first place in May and declare that their season is definitely over.